Team Foundation Server Upgrade. Done Right. Let Imaginet help you with your Microsoft Visual Studio Team Foundation Server upgrade so that it gets done right.... the first time. Schedule your TFS upgrade today. Imaginet’s 15-day Team Foundation Server (TFS) Upgrade Quick Start is designed to assist organizations transitioning from previous versions of Microsoft Visual Studio Team Foundation Server. Schedule your TFS upgrade today. Imaginet’s 15-day Team Foundation Server (TFS) Upgrade Quick Start provides an effective way to minimize downtime and maximize the benefits you receive while adopting new TFS capabilities. 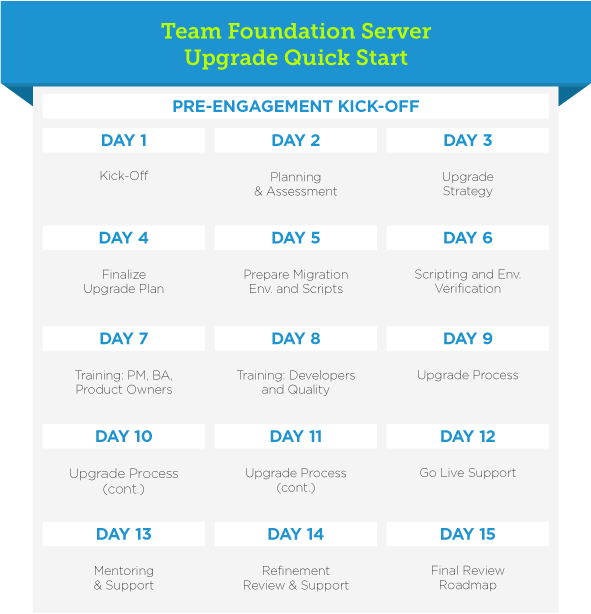 Imaginet’s Team Foundation Server (TFS) Upgrade Quick Start can be broken down into three distinct phases that span over the 15 days: Plan, Deploy and Review. Plan – Establish the current status and vision for ALM in your organization. Inventory and understand the upgrade impact for all effected roles, teams, and team projects. Choose the pilot team project(s) to target for your organization. Perform trial upgrade(s) as needed. Review build infrastructure. Deploy – Create process mapping and update scripts to enable new functionality. Define communications and plans to minimize downtime for TFS users. Provide training and set expectations for post-migration experience. Perform upgrade or migration to new TFS version. Run post-upgrade scripts to enable new functionality. Upgrade build server(s). Review – Following the successful upgrade, we work with your team to ensure a smooth transition into the new tools and features. Learn not only the new features and functions but also learn the best use of the tools from an overall Application Lifecycle Management (ALM) perspective. Training is provided for the full team and then customized for Project Managers, Development Leads, Developers, QA Teams, and Operations. As part of this 15-day Quick Start, we can help your team not only effectively upgrade your server and team projects with minimal impact to team productivity, but also we will ensure your entire team effectively uses the great new features provided with Microsoft Visual Studio and TFS. Schedule your Team Foundation Server Upgrade Quick Start TODAY. Although this 15-day Quick Start targets smaller implementations with few and/or consistent team projects, it can be used as the foundation for large enterprises and complex upgrade scenarios. When undergoing any Microsoft Team Foundation Server upgrade, you never want to do it alone. This is where the Imaginet TFS experts come in. We have helped over 650 customers around the globe with ALL their TFS needs since the first version was released over 10 years ago—and we’re ready to help you! Imaginet’s Visual Studio team have designed, deployed, and mentored organizations on Team Foundation Server and have real world experience with this tool. Your customized TFS environment will be upgraded and configured with industry leading best practices and Microsoft Certified Consultants. Our consultant will ensure that best practices are tailored for your environment and integrate with organizational processes throughout the project. Imaginet has the capability and flexibility to provide ad hoc training content to knowledgeable users on a compressed timeframe. Foremost, they are expert consultants in TFS and the ALM methodologies it incorporates. This enables them to provide system setup of the test tools and servers in addition to the training-only approach that other companies offer. Team Foundation Server Upgrade services offered worldwide.